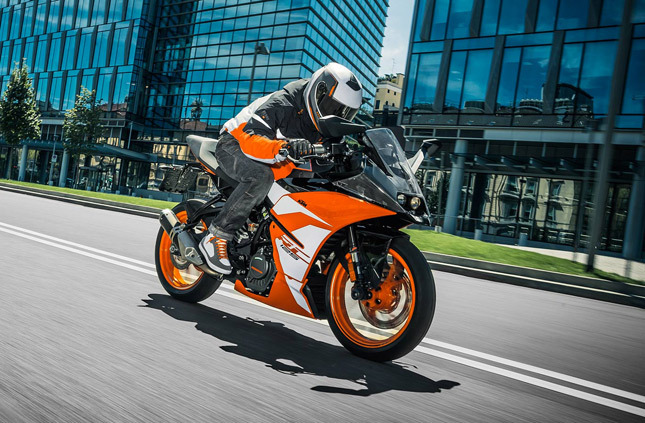 The entry level sportbike from the house of KTM is the RC 125, the bike comes featured with World class suspension setup and electronics onboard. 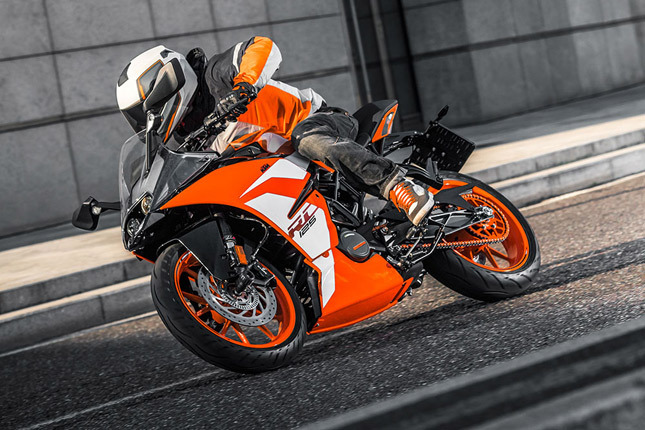 The KTM RC 125 comes equipped with 125cc single cylinder liquid cooled engine churning out just right amount of power and torque for track racing. The bike is also featured with Anti Lock Braking System (ABS). The Austrian manufacturer is famous for making super precise single cylinder engines all the way up to 700 cc engine class. What many people don’t know is that their range actually begins from 50 cc dirt bikes. The most basic model in KTM’s line up is a 50 cc 2 stroke motorcycle, which is mainly targeted towards young kids who want to learn basics of Dirt racing. The company also cares about its supersport audience and encourages young riders to take up GP racing at a young age. In order to facilitate this endeavour, KTM offers RC 125. 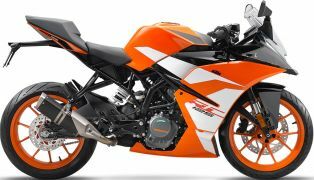 It is an entry level bike to offer supersport ergonomics and It has just enough power to facilitate an easy learning curve for amateur Riders. Engine: This RC uses a 124.7 cc single cylinder, 4-stroke liquid cooled engine which churns out 11 kW (14. 75 HP) @ 9500 RPM and 11.8 NM of torque @8000 RPM. It is a liquid cooled unit with continuous circulation of cooling liquid with a water pump. 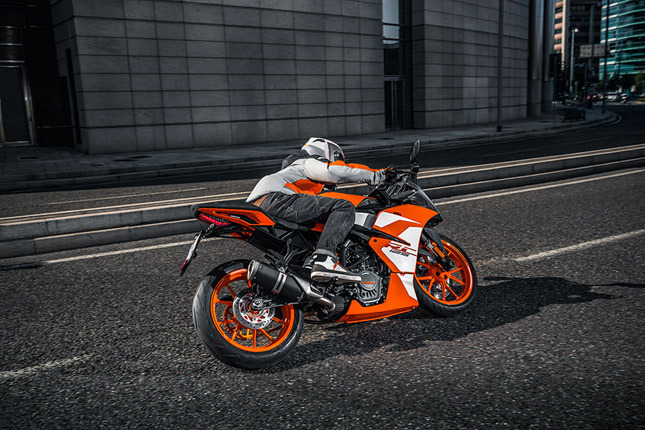 Although the torque is placed high up the rev range, the 33 mm throttle body and the precise fuel injection, amplifies the single cylinder nature of the motorcycle and delivers instant low-down torque. The bike only weighs 135 kg (dry), so even the 11 Nm of torque feels sufficient enough for corners as well as traffic. The top end of the bike is also strong due to the DOHC setup and 4-valves, which allow the engine to perform at its best for long. Chassis and Brakes: A steel trellis frame acts as the skeleton to this RC, just as well as it does for its elder siblings. The frame is light, strong and flex-free. The earlier model of the RC 125 suffered from low ground clearance but with the inclusion of new sideways mounted exhaust, the ground clearance has increased to 178.5 mm. The trail of the bike along with its wheelbase has also been reduced in this model to make the handlebar turn effortlessly. The bike uses USD WP suspensions at the front and a WP monoshock at the back. The bike sits on a 110/70 17” front and 150/60-17 rear tyre. The bike has dual channel ABS and acts on a 300 mm disc at the front and a 230 mm disc at the back. As mentioned above, the motorcycle has twin channel ABS, which is provided by BOSCH. The instrument console is similar to the one found on RC 200 and features a speedometer, Tachometer, Trip meter, Clock, fuel gauge, and gear shift indicator. The RC 125 exists on a very confusing price point. 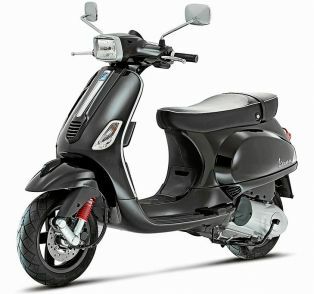 While it offers superb build quality and design but the 125 cc engine is one of its shortcomings. It doesn’t mean that it is a bad piece of engineering in any way, on the contrary, It is probably the best engine in its class. But judging by the price point (Rs 1.5 lakh) at which it would retail in India, the bike just doesn’t make any sense. That’s why the KTM sells this bike in those places which have almost no competition in small engine class. It is there, where this bike is appreciated and sold in good numbers.